Arguably Germany's greatest player in the post-Beckenbauer era, Karl-Heinz Rummenigge followed in the footsteps of Helmut Rahn, Uwe Seeler and Gerd Müller making sure West Germany's world class coverage up front was maintained. "Kalle" was born in Lippstadt in 1955 and played for the local club Borussia Lippstadt until he was 18 years old and discovered by Bayern Munich. His move to Bayern forced him to give up his job as a bank clerk and concentrate fully on football. It paid off. Rummenigge was a member of Bayern's 1976 European Cup champions and soon earned a place on the national team squad. Coach Helmut Schön picked him for the World Cup in Argentina 1978 and Kalle was one of few players who impressed in the tournament which saw West Germany bow out already in the second phase. By the 1982 World Cup in Spain, Rummenigge had established himself as one of the superstars in the game. Twice European Player of the Year, 1980 and 1981, and member of West Germany's European Championship winning team in 1980, most experts predicted Rummenigge - alongside Maradona - to be the star of the tournament. Kneeproblems prevented him from performing up to his full potential and manager Jupp Derwall used him sparingly. His memorable contribution when coming off the bench in the classic semifinal against France was the highlight of that World Cup along with his hat-trick against Chile. West Germany went from 3-1 down to equalize and later beat the French on penalties. Rummenigge first reduced the lead to 3-2 and then featured in the attack which saw Klaus Fischer equalize. A tired German team could not beat Italy in the final though and lost 3-1. Rummenigge picked up his third league topscorer title in 1984 and moved south to Italy and Inter Milan after ten years with Bayern where he had netted 162 times in 314 Bundesliga appearances. Most world stars played in Italy at the time and Rummenigge stayed for three years with mixed success. The World Cup in 1986 would end his international career. Rummenigge was once again not fully fit, but Franz Beckenbauer - now coach - was determined to bring him to Mexico. 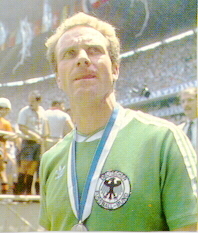 He featured in all matches, mostly as a substitute, as West Germany once again reached the final. Kalle was captain (52nd time) in his 95th and last international against Argentina in the Azteca stadium. Argentina ran out 3-2 winners - Rummenigge scored one of the West German goals - and became the first captain to lose two World Cup finals. He spent the last couple of seasons in Switzerland with Servette Genf before retiring in 1989.